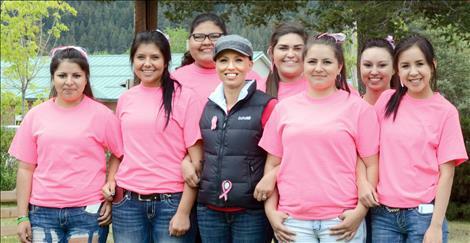 Mandy Haynes-Belcourt is surrounded and supported by a crew of volunteers in Arlee at a fundraiser, organized by Spur the Cancer Out of Montana, to help offset costs of her treatments. Mandy Haynes-Belcourt gets a hug from a supporter. Leon Wieder and Jamie Sievers of the Spur the Cancer Out of Montana organization stand with Mandy Haynes-Belcourt. Spur the Cancer team supporters wear their shirts to the fundraiser for Mandy Haynes-Belcourt. Spaghetti served on paper plates to a supportive small town is the best way to run a fundraiser, according to Spur the Cancer Out of Montana co-organizer Jamie Sievers. ARLEE – Mandy Haynes-Belcourt sensed that something was wrong. She decided to make an appointment for a mammogram, but she is only 37, and mammograms, she explained, aren’t usually given to women under 40 unless they have a family history of breast cancer. “I didn’t have any family history of breast cancer,” she said. She decided to check herself, and she found a lump. She went in for a biopsy on Feb. 3. Two days later, the doctor called to tell her the bad news. “I have a highly aggressive form of breast cancer,” she said. She was immediately scheduled for a double mastectomy and reconstructive surgery. She is currently undergoing chemotherapy and the treatment has left her tired and nauseous, but she has her sights set on the future. The treatment has slowed her down, which is a problem considering she is a mother of five children from ages 2 to 19. “Everyone has helped out a lot,” she said of her husband, family and friends. Some of that help was hard for her to accept, including a spaghetti dinner fundraiser that was held on Saturday in the Brown Building by Spur the Cancer Out of Montana. The two-person fundraising team has helped people from all over the valley with the monetary costs of cancer. Leon Wieder started the organization in honor of the aunt he lost to cancer, and Jamie Sievers lost someone to cancer and wanted to help. The first fundraiser was in St. Ignatius in 2010. 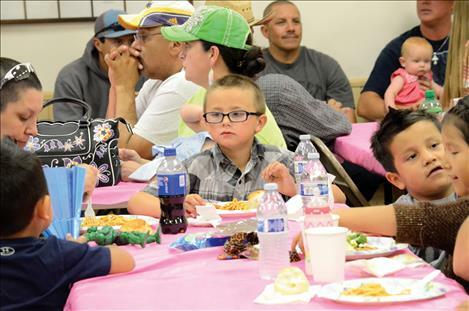 From there, they’ve organized big venue events like horse rides, rodeos and dances to raise money, but small town dinners work best. Sievers said that small towns often come together to help people, which is why it might seem like cancer is more prevalent in the area. Businesses and individuals donated items to the family, including plants, quilts and a playhouse estimated to be more than 12 feet tall. 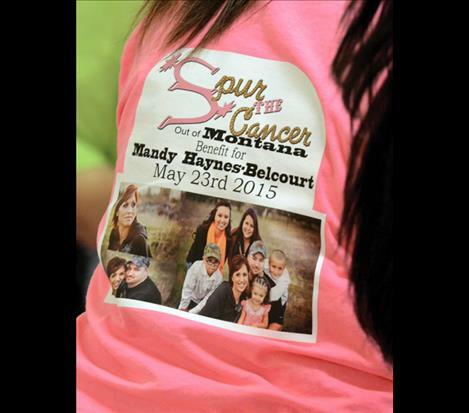 Many people also volunteered to help with the fundraiser, including Mandy’s daughter Kody Belcourt, 19. 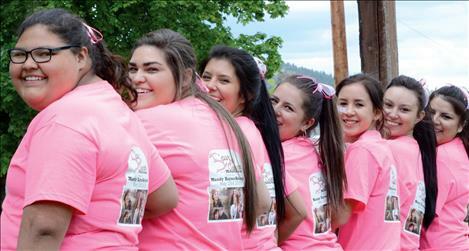 Spur the Cancer Out of Montana has scheduled another event for June 20 in Charlo, the organization’s first softball game fundraiser to help the organization save money in their nonprofit account until someone needs it.